Looking for voice over work? Maybe we can help. Here at The Voice Market we’re always happy to hear from Australian or international voice over talent who are looking to get more voice work. A brief overview of the projects we get asked to provide voice overs for would be mainly from radio stations, television networks, on hold message and production companies. They media companies (radio / TV) usually require us to get their scripts voiced and returned back to them the same day, normally in under four hours. The other types of projects, from agencies and on hold providers aren’t normally needed so soon, next day or so should suffice. What types of voiceover work do we do? 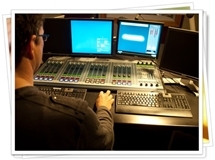 A large amount of jobs we complete are voices for radio commercials. This is due mainly to the number of stations around the country needing fresh and varied voice talent on a daily basis. We also are getting more and more corporate voiceover requests from small agencies and production companies seeking voice talent for web videos and longer narration jobs. We also require regular voice overs for on hold message companies. Mostly Australian voice over jobs. What do you need to get regular voice over opportunities? The key trait we require from our voice actors is professionalism. Most of our voice over talent has relevant experience within the radio or acting fields. You need the ability to provide great voice over reads in a variety of styles to open up your prospects. With The Voice Market, we require our talent to be able to record themselves in broadcast quality facilities. This may be a radio studio, a high quality home studio or similar as long as the sound is clear, clean and sonically acceptable. You need to be able to direct yourself to deliver the read precisely as requested on the script. Accuracy in your reading, getting things to time and getting things back promptly are also basic requirements. What opportunities can we provide you? We only have limited space on out Talent Bank. We’ve tried to cover as many bases as we can with a small range of voices. Our aim is not to have our talent competing for the same voice over jobs and therefore watering down their prospects. Occasionally we may need to fill a space in our repertoire that is currently not filled. Presently we have space for more child voice over talent. So feel free to contact us if you can provide any of the above. We’d love to hear from you if any of the above makes you feel you can provide what we’re after. Send us your demo (2MB, under two minutes, varied and professionally produced, mp3) to – studio@thevoicemarket.com.au or simply email us your interest in being alerted via The Market Place to the same address.